HTC One - With a sleek aluminium body, a live home screen that streams all of your favourite content, a photo gallery that comes to life, and dual frontal stereo speakers, the New HTC One is ready to reshape your smartphone experience. Your photo gallery brought to life. Capturing a moment takes more than one image. That's why the New HTC One includes the HTC Zoe Camera with UltraPixels. Press the shutter and the HTC One automatically captures up to 20 photos and a 3-second video—a picture that's alive. So your entire photo album becomes a living, breathing gallery. HTC UltraPixel Camera: Capture more light. Light. It's what separates a snapshot from a picture. And when you capture 300% more light with New HTC One's super-sensitive camera, taking an amazing picture is that much easier. The New HTC One delivers a dramatic increase in photo quality: more clarity, contrast and detail. Plus backlight and lowlight performance that will rescue the most challenging photo op. HTC BoomSound™: Sharper, richer, louder. On the average smartphone, sharing music or a video with friends is a frustrating experience. A tiny speaker will tame even the most ferocious track. But the New HTC One's BoomSound™ changes all that. Dual frontal stereo speakers powered by built-in amplifiers deliver bigger sound with less distortion and more detail. HTC BlinkFeed™. Your live home screen. With HTC BlinkFeed™, simply pick the social networks, news and feeds you want to stay updated on and they'll all stream live to your home screen. The pulse of your world is in the palm of your hand. Refined design. Rugged build. Inspired results. Full metal body. Zero gap construction. And tapered edges that offer a slim but satisfying grip. 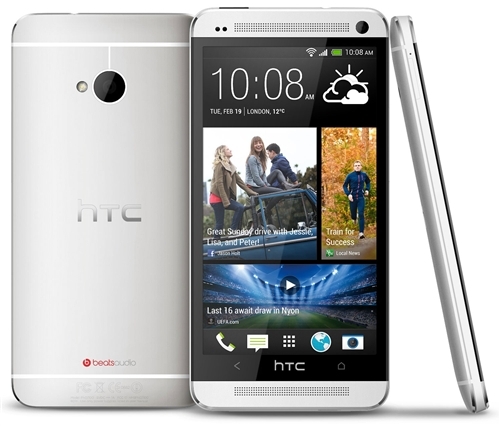 The New HTC One is phone design that doesn't compromise. Smart phone. Even smarter design. Can you innovate against wear and tear? Yes. 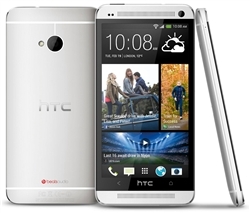 The HTC One's Infinity Glass eliminates glare and resists scratches. Which means its stunning looks will actually stay stunning—now and in the future. Sense Voice: Call clarity, even in a crowd. The world doesn't include a volume knob. So talking on the phone in any loud, crowded environment can be a challenge. The New HTC One solves that problem with Sense Voice. It includes dual built-in microphones that detect loud ambient noise and will then dynamically boost the in-call voice to compensate. Hurrah for clarity.